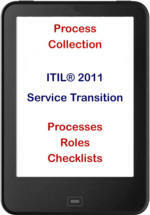 ► Read here what you can expect from the new ITIL® 4! (T. Evers, Humana Insurance, USA). Free access to our ITSM Archive and free update to ITIL® 4 (as soon as available) for purchase dates of the complete process sets from October 15th on! All customers of the complete package will get an everlasting access to our ITSM Archive (templates, KPI proposals, checklists) which we are creating during the further development of our ITIL® 2011 Process Library - thus you receive always the most actual ITSM documents independent of the purchasing date for free! ► Visit our ITSM Archive! Please click the above button in case you want to be informed in case of an update of our ITSM Archive. ► Business Terms of the ITSM Portal. Charging is executed by secure transaction via Digistore24. Immediately after the transaction you will be provided a printable, tax deductible invoice via Digistore24 and transferred to the download page automatically. All our ITSM templates are supplied with a 60 day money back guarantee. Our process collections are based upon the well known ► ITIL® 2011 Process Library from ► Dipl.-Ing. Walter Abel Management Consulting. It contains the processes of IT Service Management in the leading process management system ► Signavio Process Manager notated in BPMN 2.0 based upon nearly 20 years of ITSM project experience. It supported the implementation of process oriented IT Service Management for a lot of customers world wide up to now. and thus accelerates your project remarkably and hence saves costs (especially external consulting costs). These process manuals are not for provision of theoretical knowledge but show the experience of many implementations of process oriented IT Service Management from practice. From the ITIL® - perspective all partial topics have more or less the same priority but practice depicts a different scenario. Accordingly we set up our process library described here, focusing on practical relevance. ITIL® is registered trademark of AXELOS Limited. Except as expressly indicated, Digistore24 does not endorse and is not affiliated with any third party product, service, statement, or opinion.